An iron unidentified object of uncertain date. The object is L shaped in plan. One terminal has a crude knop, which then expands out towards a corner before extending forwards to form the second arm. The arm with the knop is D shaped in cross section, while the other arm is broadly lenticular in cross section. A short projection is situated on the outer edge of the upper arm, towards the corner. It is difficult to discern if the terminals end in breaks, but due to their uneven edges it is likely. The object is heavily corroded, with a brown-orange patina on the surface. The inner surface has faint areas of green corrosion, which imply a copper-alloy content or contact with a copper alloy object. The object appears to be quite crudely made, and it is possible it is casting waste or similar. 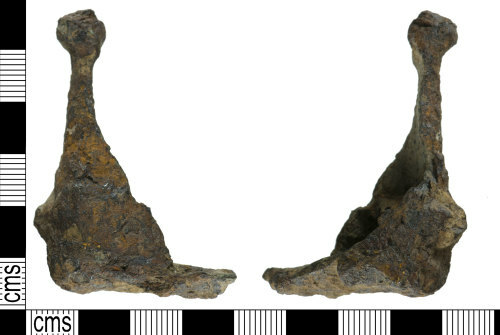 However, due to its presence on a site which has yielded Early Medieval objects, it is possibile that it is part of a bell or stirrup (cf. WAW-989551). The object measures 53.79mm in length, 38.79mm in width, 19.77mm in thickness at its thickest, 9.93mm at its thinnest and weighs 36.08g.